All websites have hyperlinks that you click on to take you to other local pages or to other sites on the internet. Sometimes though, you might find there is a link to another page or to send an email but it doesn’t do anything when you click on it. This can be for various reasons such as an issue with the page, the author didn’t create the links properly or the links are purposely disabled for antispam or to save having broken links on the page. Normally to open the link you would have to highlight the text URL, then drag it into the browser address bar. 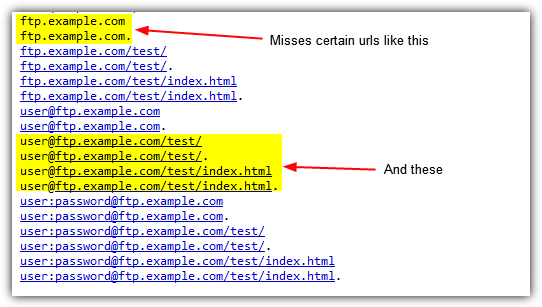 Although leaving URL links as text can be done for very legitimate reasons, you might like to have all the links on a page show correctly so when clicked on they take you to the target URL. Thankfully, because most browsers support extensions, it is perfectly possible to install an add on to help turn unclickable links into clickable links automatically. Here we show you 6 ways to do this for popular browsers. The first thing to note about Clickable Links is it’s ad supported meaning it can inject ads into web pages. This has caused some controversy among users and the ads need manually disabling in the Options window in the likely event you’ll want to turn them off. This can also cause an alert in some security software, Avast’s Browser Cleanup tool says Clickable Links has a poor rating, this is obviously related to the ads and not how the extension works. Clickable Links has a few useful things in its Options window such as enabling on secure websites, enabling email conversions and a blacklist where you can type in and exclude specific domains from being linkified. On the whole it works reasonably well but ignores IRC, telnet, NNTP and news, so only the basic HTTP(S), mailto and FTP are converted. 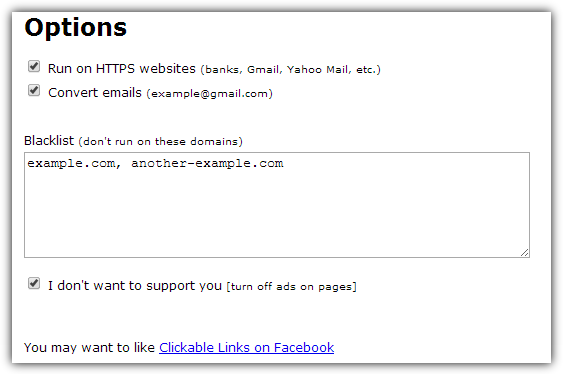 Clickable Links has a simple url test page to check whether it or a similar add on is working. 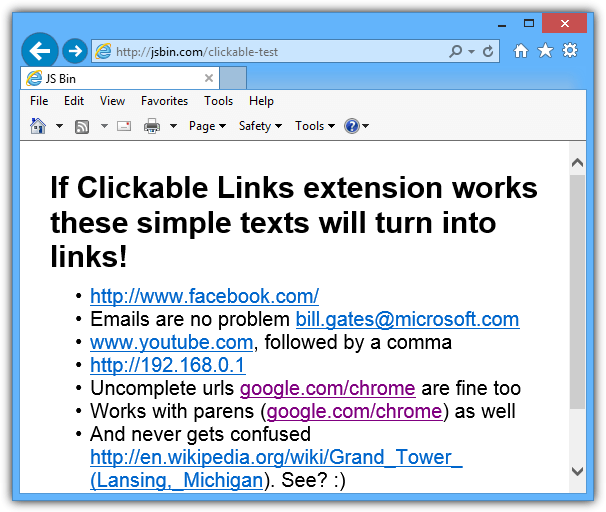 Text Link is another add on for Google Chrome and any other browsers that support Chrome extensions. It is slightly less advanced than Clickable Links with no configurable options, so for example you can’t exclude specific websites, but it does have an advantage of not having any involvement in ad serving. During testing Text Link does seem to do a better job than Clickable Links at detecting all of the basic and standard types of URL. It only really has a problem when including a username and password in the URL, such as “username:password@ftp.domain.com”. Subpages are also ignored on this type of link, e.g. “user@ftp.domain.com/site/”. Other than that, it works well. Linkification is possibly the original text link to clickable link add on because it dates way back to 2004 and is still around today, although it hasn’t received any updates since 2010. The website has a useful links test case page where you can thoroughly test this and any other text to clickable link add on. We tested all the add ons listed here on that page to show up any inconsistencies because it’s a good reference. 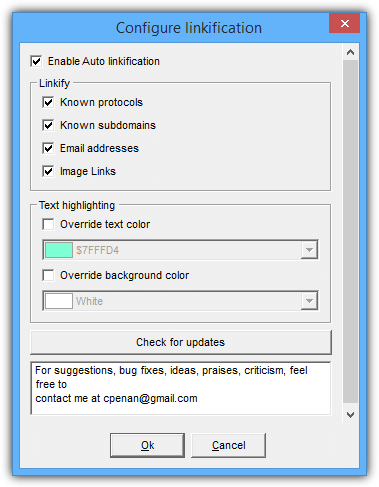 Linkification contains a number of options, accessible by pressing Ctrl+Shift+A. You have a large degree of control over what type of links will be converted, what happens when you click on them, what color the linkified links are, which protocols and elements are recognized, and a page size limit. 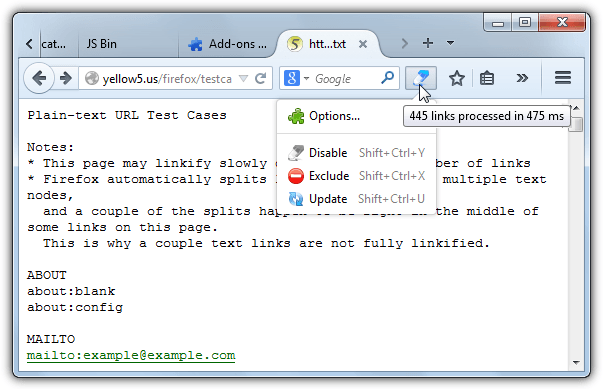 Linkification itself can be turned on and off in page with the Ctrl+Shift+L combination. 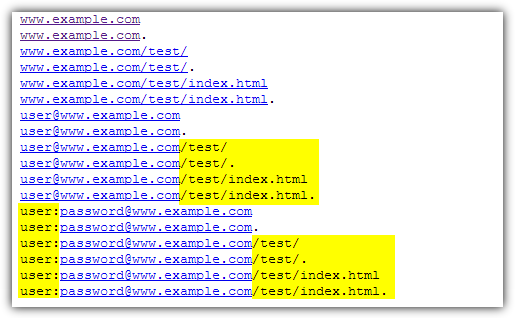 As you might expect, the test case page is perfect and also the simple Clickable Links test page work 100%. This is possibly the best test URL linkifier on any browser. Linkificator is quite similar to Linkification above but possibly includes even more options to tailor everything to your requirements. The main advantage of using this add on though is it’s actively updated and maintained so any bugs or incompatibilities with future versions of Firefox are far more likely to be fixed. 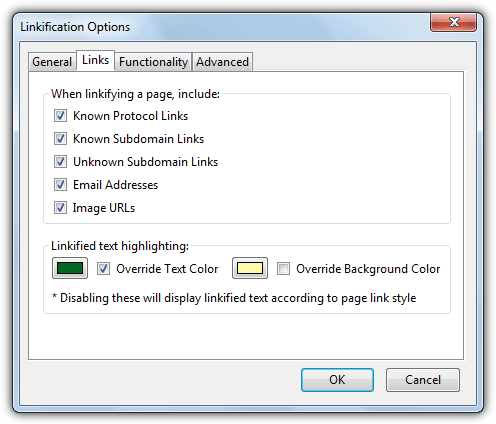 Many of the settings are broadly the same as Linkification, apart from Linkificator has a separate whitelist and blacklist, a widget icon that can disable/enable, include/exclude and update the links on the current page, can create custom rules and the ability to edit the protocols, sub domains, required characters, elements and maximum data size. The default hotkey combination of Ctrl+Shift+Y will turn the on-page conversions on or off. Results are very good and pretty much identical to Linkification. As Opera is now using the Webkit browser engine, newer versions after 12 can use Chrome extensions from the Google Web Store like Clickable Links or Text Link. However, many Opera users are hanging onto version 12 because they don’t like the direction the webkit version has gone, so a different add on is needed to work on the older browser. Linkify is one such add-on that works on Opera 12 and is almost as effective as the other add-ons for Chrome and Firefox. The only places it really falls down are recognizing certain subdomains, for example it doesn’t linkify URLs like “ftp.domain.com” or “irc.domain.com”, and sometimes it gets confused detecting an email link (with “username@”). There are no settings to configure, just install and use. Because Internet Explorer doesn’t use extensions like Chrome and firefox, there’s a restriction on ways to be able to convert text links into clickable links. The only compatible tool we know of for this purpose is IE Linkification. Sadly it dates to 2008 when Internet Explorer 8 was the major version, so is designed for a browser at least three generations old. We tested IE Linkification on Internet Explorer 11 in Windows 7 and 8.1 and it does actually work although it isn’t without a few problems. To install the tool on IE9+ you need to download and install the setup file, launch IE and allow the “IE Mix” add on, then press Alt+T to show the tools menu and select “Configure Linkification”. Then enable the options you want in the Configure window, note the color options don’t work. The shortcut to convert all unlinked text URLs into clickable links is Ctrl+Shift+L. By default auto linkification is turned off and you need to turn it on in configuration before links will be converted. Do note that IE on Windows 8/8.1 will crash twice when selecting the Configure Linkification menu entry, then weirdly the window pops up on the third try. As you can see from the screenshot above, IE Linkification does work on newer Internet Explorer versions and operating systems, but becomes a bit more stable and compatible the further you go back as it was designed in the XP era for an XP/Vista based browser. Yeah I have been using this extension for a while now. It is pretty awesome. Another that does the same for IE, as well as a few other useful tricks, is the Quero toolbar (quero.at) Highlight what you think of as the link, for example, the quero site address in the brackets above, Right click on the highlighted section and Click on Goto URL from the drop down menu.